So far this year 8,625 people have been arrested for theft of services in New York City, data show. NEW YORK CITY — Police have arrested around 8,625 people for jumping turnstiles so far this year, about 89 percent of whom were black and Latino, according to data obtained from the state. And of those arrestees, about a quarter of them spent some amount of time in jail for the offense, according to records from the State's Division of Criminal Justice Services, which includes thefts of all public transportation services including train, subway, bus and taxi fares, though the sweeping majority of the charges occur in the subway. Around 2,220 people spent some amount of time in jail for the crime this year, with 230 sentenced to jail time and another 1,790 people getting time served as part of a guilty plea, state records from January 2017 through mid-June show. Sixty-eight percent of the arrests take place in Manhattan and Brooklyn. The approximately 8,000 arrestees represent only about about a quarter of all New Yorkers cited for farebeating, according to NYPD officials, who say that three out of every four turnstile jumper is written a summons and not arrested for the offense. Times Square and Union Square have some of the highest numbers of arrests, according to Robert Diehl, Acting Vice President of Security of for New York City Transit at a Monday MTA board meeting where turnstile jumping was discussed. He did not give more specifics and the MTA and the NYPD declined to clarify further on his remarks. Diehl insisted that police don't go out aiming to catch farebeaters. "As far as the deployment, we never send people out to do theft of service operations," he said. "We put people out in our busiest stations based on ridership and crime." "What happens there is if they see somebody jump a turnstile; they take appropriate action," he said. David Jones, a mayoral appointee to the MTA's board who has been pushing for better data on who is arrested for farebeating and where the arrests occur to the resistance of the NYPD, argued the MTA and the NYPD ought to put in place more "preventative steps so people don't even get into this whole morass." "At least our preliminary understanding is this is a crime of poverty," he said. "Let's put signage, let's put everything we can to prevent young people from making this mistake," he said, adding that getting arrested for farebeating could be gateway into the criminal justice system. People arrested are not "even aware of how damaging this can be," he said. 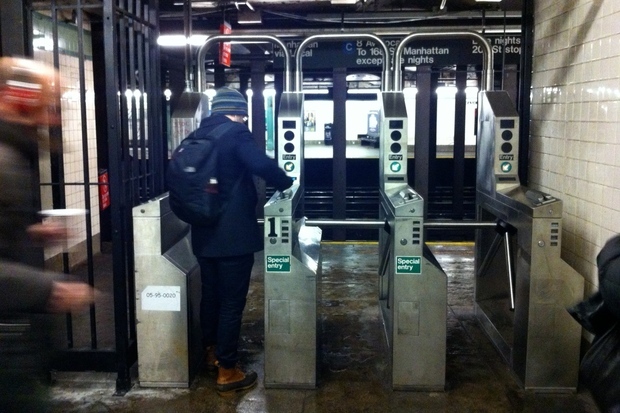 Those charged with turnstile jumping can face fines of $100 as well as "host of collateral consequences," including even detention and deportation for undocumented New Yorkers, said Tina Luongo, a Legal Aid Society lawyer. "Until the city terminates broken windows policing, arrests for low-level offenses will continue to plague communities of color in every borough," she said. But Diehl insisted that police can't just turn a blind eye to people who jump the turnstile. "To see [farebeating] happen rampantly sets a tone of disorder," Diehl said. "[It's] something that’s critical to people feeling like they have an orderly subway."